Big lack of updates recently due to Peter concentrating on regularly posting on his Facebook page,which we hope many of you have been occasionally visiting to read his updates on everything music, food, art and garden. For those of you who’ve not, here is an important update featuring the rare demo of ‘Looking Through the Eyes of a Child’ which Peter worked on with Andy Hill and Albert Hammond. This is the first of a number of demos Peter will be uploading in the coming weeks and months, please do check back for more and join Peter on Facebook if you aren’t already doing so! Here is a new haiku written by Peter on November 9th, which we have added to the haiku section. While Peter is preparing his Leo Computers article, here is a new haiku he wrote early this morning. 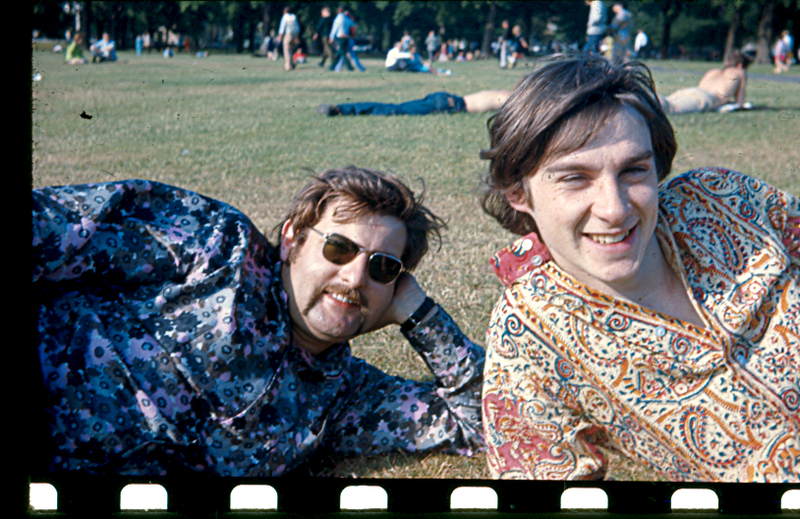 Peter with his long time, good friend “Uncle” Dik Fraser in 1967 after an afternoon of kite flying in Kensington Gardens. Peter and Dik met in 1963 when they both worked for Leo Computers (more on Peter’s computer days & how they influenced his later career soon). In 1969 Peter & Dik became King Crimson’s first roadies. Peter gave up his roadie duties after 6 months and Dik went on to become tour manager for King Crimson, ELP, King Crimson (redux), Roxy Music, Genesis, Eddie Murphy, .38 Special, Sonny Rollins and Claude Bolling. He is a partner in The Usual Suspects, an event production company. Dik has lived in New York since 1975 with his wife Dorothy and daughter Wendy. Despite the lack of updates on Song Soup on Sea for the past few months, Peter has been frequently updating his Facebook page with news and tidbits which you can follow here. He has also written two new haiku, including the following which will lead nicely into our next update which is coming shortly. We have been rather quiet on Song Soup on Sea lately, mainly because we are working on many improvements for the website & it’s long awaited ‘shop’ section, which we aim to open this summer. In the meantime, we have created Peter’s official Facebook profile which we will be updating with news in conjuction with Song Soup on Sea. So if you are a regular user (which makes it sound like a terrible drug, a debate for another time..), we’d love to see you there. Press “Like” to join the page. .. to all visitors of Song Soup on Sea. We have recently been making a return to the typewriter – this letter from 1969 was written on an old Imperial Typewriter. It precedes 12 pages of handwritten notes, a rare and personal account of what it was like to in King Crimson at the time! 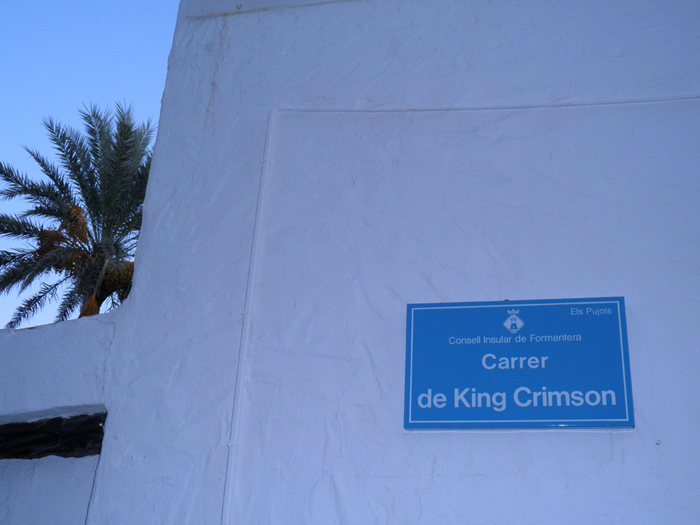 Thankyou to Pedro Martin for sending us this photo of sign on a street by the Formentera seaside, placed last year, for which Peter was touched to see in his inbox. We wish our visitors a peaceful and brave new year with much love from Song Soup on Sea and we have more updates for you very soon.